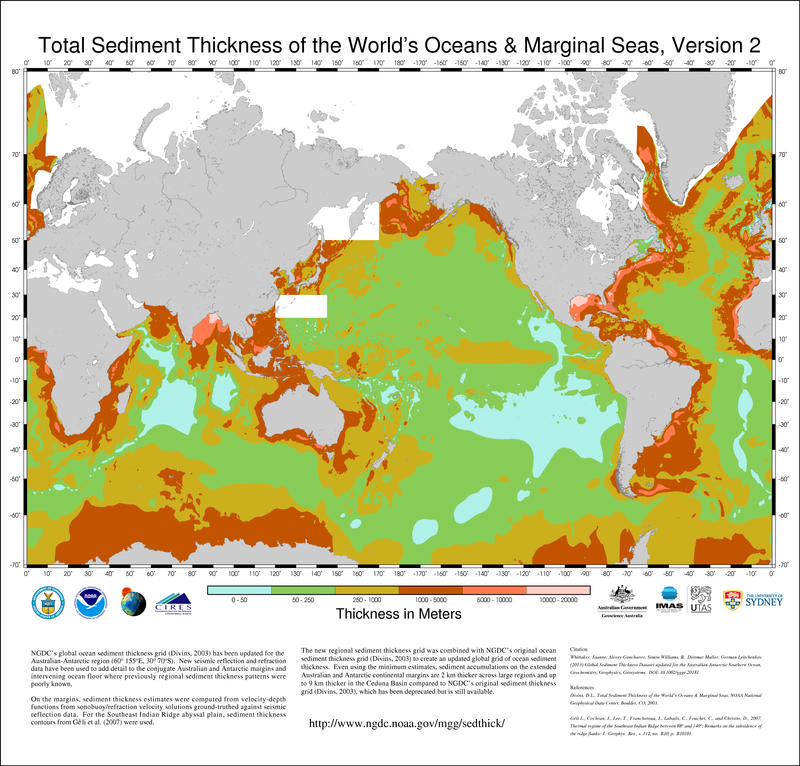 NGDC's global ocean sediment thickness grid (Divins, 2003) has been updated for the Australian-Antarctic region (60?? -155?? E, 30?? -70?? S). New seismic reflection and refraction data have been used to add detail to the conjugate Australian and Antarctic margins and intervening ocean floor where previously regional sediment thickness patterns were poorly known. On the margins, sediment thickness estimates were computed from velocity-depth functions from sonobuoy/refraction velocity solutions ground-truthed against seismic reflection data. For the Southeast Indian Ridge abyssal plain, sediment thickness contours from G? ?li et al. (2007) were used. The new regional sediment thickness grid was combined with NGDC's original ocean sediment thickness grid (Divins, 2003) to create an updated global grid of ocean sediment thickness. Even using the minimum estimates, sediment accumulations on the extended Australian and Antarctic continental margins are 2 km thicker across large regions and up to 9 km thicker in the Ceduna Basin compared to NGDC's original sediment thickness grid (Divins, 2003), which has been deprecated but is still available. Purpose To update NGDC's global sediment-thickness database for use by researchers and interested public. 2013-01-01T00:00:00 - We compute new, regional 5-minute resolution sediment thickness grids using seismic reflection and refraction derived sediment thicknesses for the southern Australian and conjugate Antarctic Wilkes Land margins, merged with sediment thickness data from G? ?li et al. (2007) for the intervening abyssal plains. Values from the NGDC global sediment thickness grid (Divins, 2004) were used for areas not covered by the other data sets.